After weeks of rest and preparation on Staten Island, the British and Hessian forces under the overall command of Gen. William Howe are finally on the move. It is late August 1776, and the weather has been rainy. 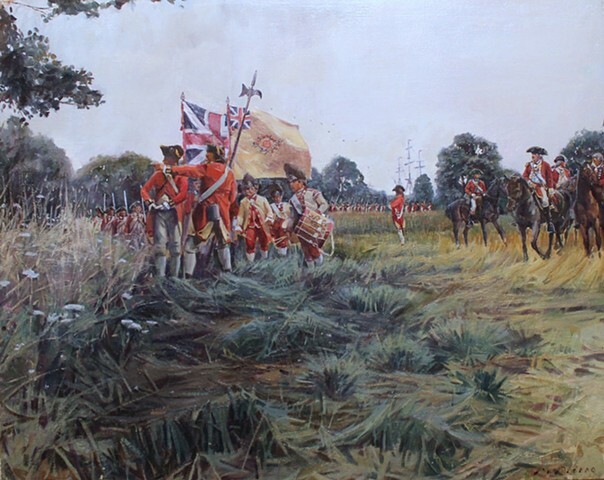 This painting depicts the 22nd Regiment of Foot as it winds its way through a field past Brigadier Gen. Francis Smith and his staff. Their destination is the shore of Gravesend Bay, where they will land without opposition. In a matter of days, these well-trained professional soldiers will be involved in the driving Gen. George Washington’s untried army from Brooklyn Heights, in what would become the largest battle of the American Revolution. Even though Washington would lose the battle, he would live to fight another day by keeping his retreating army intact.